This letter AUM (OM), indeed, is the (inferior) Brahman (Hiranyagarbha); and this letter is, indeed, the Supreme Brahman. Anybody, who, while meditating on this letter, wants any of the two, to him comes that. This medium is the best; this medium is the Supreme (and the inferior) Brahman. Meditating on this medium, one becomes adorable in the world of Brahman. AUM being the sound symbol of Parmatman (Supreme Reality), it is considered to be the first vibration as sound emanating at the beginning of creation. From the three matras of AUM came out the three 'feet' of Gayatri, and from its three 'feet' came out the three Vedas and the three Vyaahrtis BHUR-BHUVAH-SUVAH representing the three cosmic world planes. From A came out tat savitur varenyam which expanded itself into the Rg-Veda and the cosmic plane Bhuh. From U came out bhargo devasya dhimahi, which expanded itself into Yajur Veda and the plane of bhuvah. From M came out dhiyo yo nah prachodayat- which expanded itself into Sam Veda, and the plane of suvah. The first Veda RG is stuti-para-devoted to devotion. The second Veda Yajur is kriya-para - devoted to work (action). The third Veda Sam is jnana-para -devoted to knowledge. Om, we meditate(dhimahi) on the spiritual effulgence(bhargas) of that adorable Supreme Divine Reality (varenyam devasya), the source or projector (savitr) of the three phenomenal world planes the gross or physical (bhuh) the subtle or psychical (bhuvah) and the potential or causal (suvah), both macro cosmically or externally and micro cosmically or internally. our(nah) intellect(dhiyah), so that we may realise the Supreme Truth. The presiding deity of the Gayatri Mantra is Lord Sun. 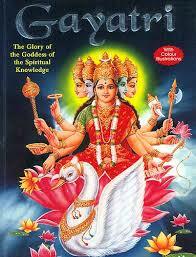 Gayatri is personified as a goddess, the consort of Brahma (Sarasvati), and mother of the Vedas. The Gayatri Mantra is never chanted for the purposes of material gains, physical or otherwise. Its very invocation concludes with an appeal to the pure Consciousness to illumine more our heart-mind. It is a prayer unto the Self to unveil itself and come to manifest as pure wisdom in our life. The Gayatri Mantra is one of the oldest available Divine hymns. In the ancient Vedic literature, this mantra is dedicated to the deity Sun. This mantra is sung in the Vedic-meter called Gayatri. This is considered to be the most important mantra written out in Gayatri meter, and therefore, by tradition, this mantra has come to be known as Gayatri. It has actually been observed that by the repetition of this Gayatri Mantra with the right understanding of its sacred meaning, the ordinary negative tendencies in the human mind can be erased out to a large extent. It is believed that for any one frightened in the dark, immediate chanting of the Gayatri Mantra is advised to get over the nervousness of the fright. 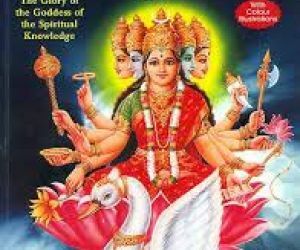 It is also believed that on starting any important and great work if a person detects some bad omen, that person must immediately sit down and chant eleven times the Gayatri. If on starting again, he meets with a new set of bad omens then he is to sit down again and chant the Gayatri for sixteen times, to remove the effects of the bad omen encountered. In our inner life, the sun represents the light-giver, the illuminator of all experiences, the ATMAN(Soul). This pure consciousness in us, the inner centre of our personality around which the matter envelopments function with mathematical precision- just as around the sun the entire solar system revolves- is being invoked to shine more and more in our intellect. Without the Atman ( the light that is our consciousness), the bodily matters become inert and dead, just as without the sun life would have been impossible.